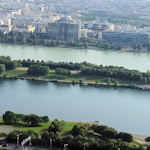 The Danube in Vienna is often a terrible disappointment for those imagining a giant beast of a river coursing its way from Germany down to the Black Sea. This is because what people think is the Danube, well, isn’t. In London, for example, you have the Thames winding its way through the very center of the city. The Seine in Paris is similar. So people assume the unremarkable waterways at the heart of Vienna must be the famous Danube. The map below shows you the main bodies of water in the city. The central district is marked in black. The Danube is the thick blue river running from NW to SE. As you can see, it crosses the upper part of Vienna, well away from the historical center. It’s easy to understand how confusion arises because there are two river-like waterways skirting the edges of the center (the orange and purple lines). You’d expect one of them to be the Danube. Parts of the city (like the Naschmarkt) are built over it, so the Wienfluss is actually underground for some of its journey. It eventually joins another river (the purple line) at the NE point of the city center. This second river is quite wide and is the one most often mislabelled as the Danube. It’s the Donaukanal or Danube Canal (though it’s best to think of it as a channel, not a canal). So why did they build the city away from the actual Danube? The Donuakanal was the main arm of the Danube in the early days of Vienna. However, the river’s width and course often changed after floods. With time, the main arm shifted away, leaving the city perched on the edge of a slightly less impressive Donaukanal. Of course, the waterways are now heavily regulated, so there’s not likely to be any course changes in the future. To the NE of the Danube you can see another small waterway on the map (the short green area): the Alte Donau or Old Danube. Again, this was also once a main arm of the river. The authorities eventually had enough of the floods and vagaries of the Danube, so in the late 19th century they put an end to it all. Still with me? Because we’re not finished. The main “actual” Danube was further regulated in the 1970s and “split” into two parallel arms where it passes through the city. Although it’s not conveniently placed in the centre, the Danube is easy to reach on the fast subway system. Line U1: Stations Vorgartenstraße (southern bank), Donauinsel (on the island) and Kaisermühlen VIC (northern bank). The next stop after Kaisermühlen is the station Alte Donau, which is ideal for visiting, um, the Alte Donau. Line U6: Stations Handelskai (southern bank) and Neue Donau (northern bank). Once you get there, you’ll find walking and cycle paths more or less all the way along the river. In fact, a popular pastime among locals and tourists alike is to cycle along an extended stretch of the Danube through Austria and beyond (details here).